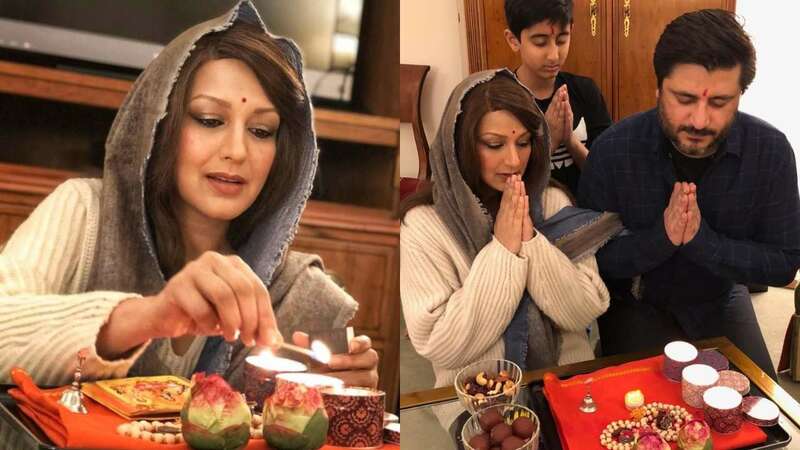 Nov 8 (AZINS) Former Bollywood actress Sonali Bendre Behl, who is currently undergoing medical treatment for cancer in New York, had a simple Diwali celebration with husband Goldie Behl and son Ranveer. Sharing a few pictures from her Diwali puja, Sonali wrote on Friday: “Diwali in New York happens much later than in Mumbai... Hence the late wish! It was quite an unconventional one... We didn't have Indian clothes, we had a small puja... But it was all heart. Happy Diwali everyone! May this year bring you good health, wealth and prosperity... Hope you celebrated this festival with your family and friends, and hope you cherish every moment of happiness with them!" Sonali can be seen lighting candles and offering prayers to Lord Ganesha and Goddess Lakshmi idols. For the prasad, they offered a bowl of gulab jamun and dry fruits.